Slice the bread in 3/4 inch slices, being careful not to slice through the bottom of the bread. Place the bread on a sheet of foil large enough to wrap around the bread entirely. 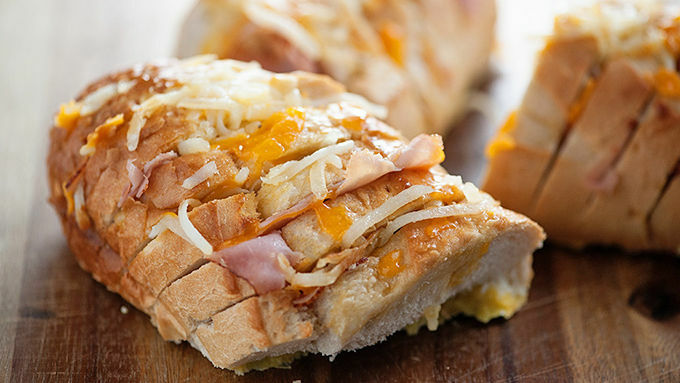 Stuff each slice with ham, cheese, and hash browns, being careful not to break apart the loaf of bread. Whisk together the eggs and milk. Slowly drizzle over the bread. 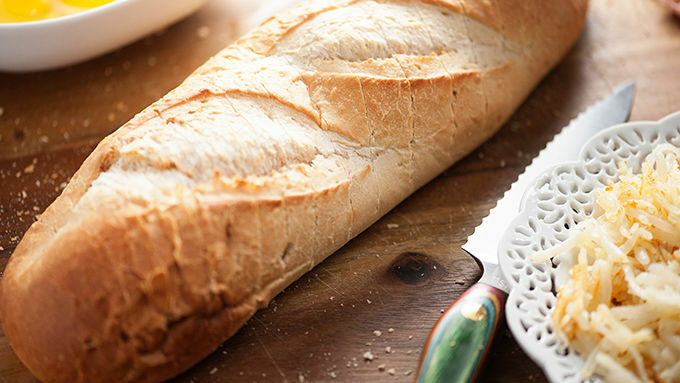 Wrap the foil tightly around the bread and refrigerate for 4 hours. Bake in a preheated 350°F oven for 20 minutes. Remove from the foil and serve. 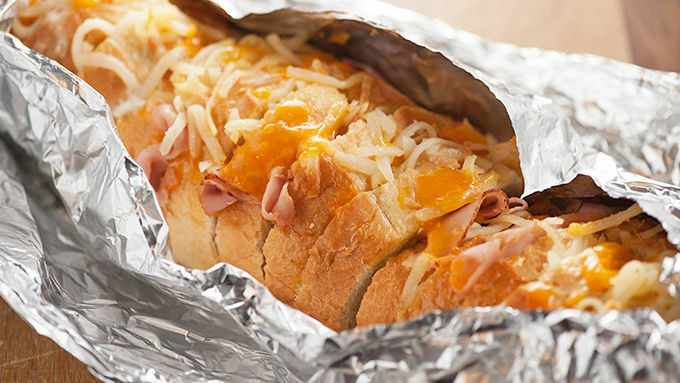 If your bread breaks while cutting or stuffing with the ham and cheese, just keep on filling it and then wrap it all as one big loaf in the foil. A throw-together pull apart for lazy morning brunches. Raise your hand if you’re a brunch fanatic. I mean, let me be honest for a moment here: I didn’t always love brunch. But that’s only because I didn’t get it. I mean, was it breakfast? Was it lunch? Was it just a really oddly timed meal? Now, I get it. 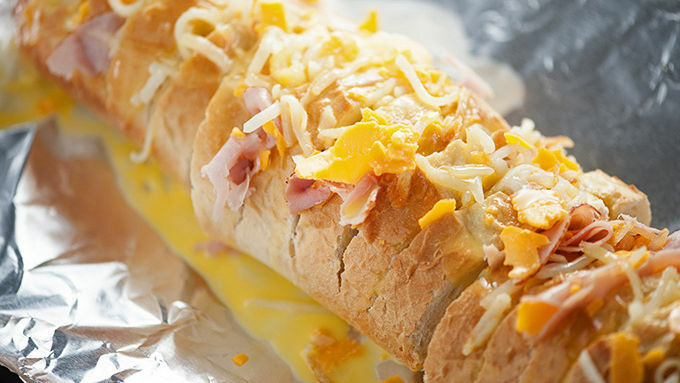 It’s both breakfast and lunch all rolled into one for the perfect lazy weekend meal. I’m a fan. So, I whipped up a fun pull apart bread loaded with ham, cheese, hash browns, and then covered in eggs for you. 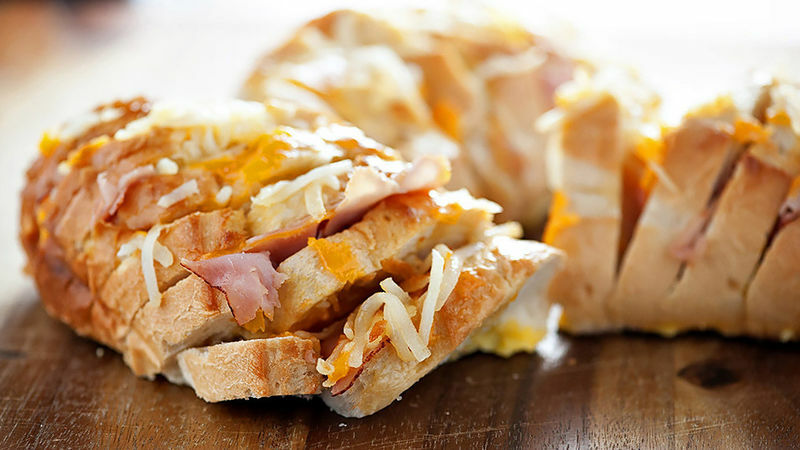 Cheesy brunch perfection!